Edwin McM. Stanton (1814-69) Secretary of War (1862-68), Ohio. 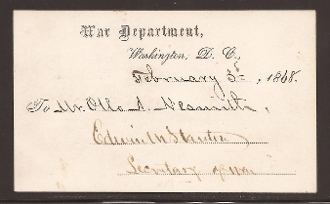 Card Signed as Secretary of War, "War Department, Washington, D.C." imprint, February 3rd, 1868.